PAIR OF KINGS: Sam Pitman and Jimmy Syrigos with their weekend kingfish catch. The kingfish action only became hotter over the past week, with offshore and The Rip producing fish. 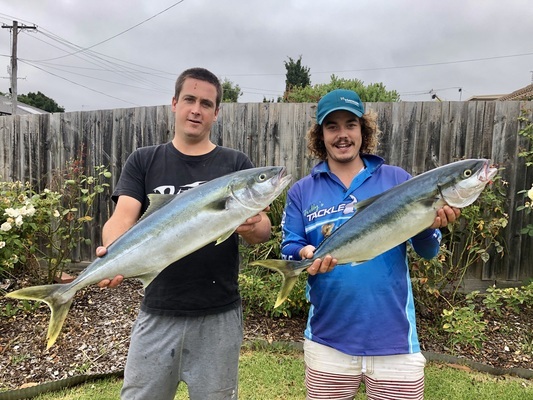 Sam Pitman and Jimmy Syrigos fished in 30m off Ocean Grove with 150g knife jigs, catching a kingfish of 80cm each and losing another at the boat. The Rip fished well for big kings on live bait like slimy mackerel and squid. Even trolling live slimeys dropped down on downriggers produced big fish from the depths. Offshore anglers also found huge Australian salmon, some to 4kg. Trolling squid skirts and casting Sluggos and jerk shad soft plastics intended for kingfish saw anglers snag good numbers of salmon from Barwon Heads to Point Lonsdale. Whiting were on the bite at St Leonards in around 4m to 6m of water. Fishing the middle of a moving tide with pippies for bait was most productive, although some moving was sometimes required to catch a good bag of fish ranging in size around 35cm. Clifton Springs also fished well for whiting in water from 3.5m 7m. From all reports, this area was holding bigger fish to around the high 30s in length. The grammar school lagoon produced quality flathead around 60cm. Fishing the deeper water or the edge of the channel on the bottom with bluebait or soft plastics was effective, with the possible bycatch of pinkies and pike. Land-based anglers chasing a flathead should try the St Helens boat ramp rocks or the North Shore rocks. The calm winds across the Bellarine Peninsula allowed anglers to enjoy clean water for chasing squid off any of the piers or jetties from Portarlington to St Leonards. Casting jigs from size 3 to 3.5 in a white or green colour produced best results. Anglers caught trout at Lake Purrumbete either deep with downriggers or fishing mudeye close to the weeds edge on first or last light. Redfin were still in huge numbers and taking soft plastics or worms. Now is a good time to take advantage of the Barwon River’s clean conditions from Queen’s Park to Breakwater. Carp are being caught on sweet corn and bread, while redfin will take a worm or small diving lure.